Objective: The International Finance Corporation (IFC)is seeking a firm to conduct an economic and social impact evaluation(ESIE)of selected water and wastewater investments in China. The quantitative component of this analysis will focus on GDP and employment impacts at a regional and/or national level. IFC has conducted a thorough literature review exploring the conceptual connection between interventions in water/waste water projects and welfare. IFC is seeking to build on this literature review to conduct the ESIE of selected investments in China. The project entails the development of a generic Excel-based tool to quantify ex-ante the value added by water/waste water sector investments to relevant macroeconomic sectors. Wastewater resource recovery is being implemented in many countries around the world but this is usually done in an ad-hoc basis and is not part of a long-term national strategy or policy. There are successes and failures around the world and information on the technological options abound, but there is much less information available on the institutional, regulatory and policy frameworks that incentivize these schemes nor on the financing/contractual arrangements behind these approaches. 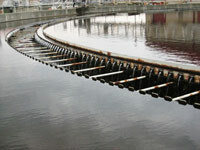 Many developing countries still think of wastewater as a waste; as something that needs to be treated and discharged. There is a need to move from a linear to a circular thinking. The Trade & Competitiveness Global Practice, which is a joint practice between the World Bank and International Finance Corporation (IFC), is assisting the Nouadhibou Free Zone (Mauritania) to ramp up the competitiveness of their fisheries cluster and to reduce the barriers to foreign direct investment. The deficiency in waste water treatment appears to be one of the critical infrastructure gap to be filled to switch to a more sustainable fish processing implementation. The overall objective of this assignment is to prepare a survey the Nouadhibou Free Zone (NFZ), the beneficiary for the construction and operation of a wastewater treatment plant to treat the waste water generated from the operations of the fisheries cluster, including re-use of the treated effluent for other purposes if viable. The final deliverable, the survey report, will be used for the benefit of tendering for selection of the main Contractor to build the plant.